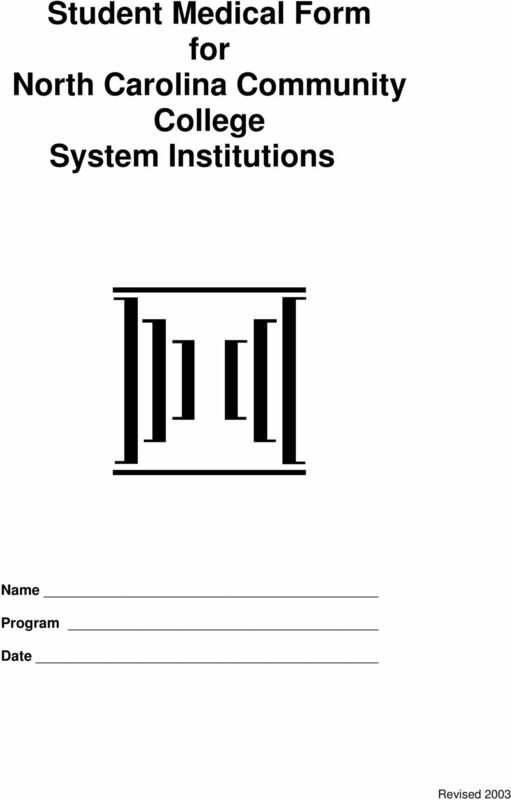 Download "Student Medical Form for North Carolina Community College System Institutions"
3 REPORT FAMILY & OF PERSONAL MEDICAL HEALTH HISTORY HISTORY-CONTINUED (Please print in black (Please ink) print in black ink) To To be be completed by student LAST NAME (print) FIRST NAME MIDDLE/MAIDEN NAME PERSONAL ID#(PID) *SOCIAL SECURITY NUMBER PERMANENT ADDRESS CITY STATE ZIP CODE AREA CODE/PHONE NUMBER DATE OF BIRTH (mo/day/yr) GENDER M F MARITAL STATUS S M OTHER CLASS YOU ARE ENTERING (circle): FR. SO. JR. SR. GRAD. PROF. PREVIOUSLY ENROLLED HERE YES NO IF YES, DATES PREVIOUSLY A PATIENT HERE YES NO IF YES, DATES SEMESTER ENTERING (circle): FALL SPRING SUMMER SUMMER 2 OTHER YEAR 2 HOSPITAL/HEALTH INSURANCE (NAME AND ADDRESS OF COMPANY) AREA CODE/TELEPHONE NUMBER NAME OF POLICY HOLDER *SOCIAL SECURITY NUMBER EMPLOYER POLICY OR CERTIFICATE NUMBER GROUP NUMBER IS THIS AN HMO/PPO/MANAGED CARE PLAN? YES NO NAME OF PERSON TO CONTACT IN CASE OF EMERGENCY RELATIONSHIP ADDRESS CITY STATE ZIP CODE AREA CODE/PHONE NUMBER The following health history is confidential, does not affect your admission status and, except in an emergency situation or by court order, will not be released without your written permission. Please attach additional sheets for any items that require fuller explanation. 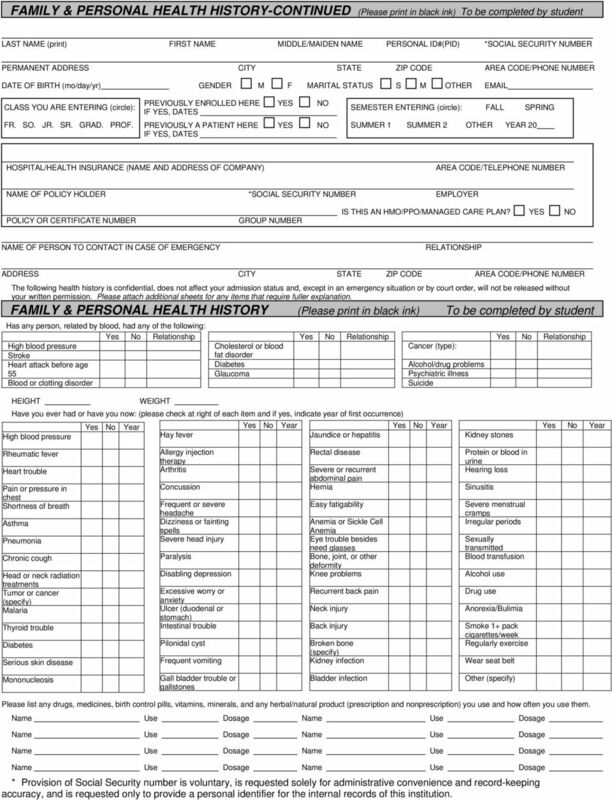 FAMILY & PERSONAL HEALTH HISTORY (Please print in black ink) To be completed by student Has any person, related by blood, had any of the following: Yes No Relationship High blood pressure Stroke Heart attack before age 55 Blood or clotting disorder Cholesterol or blood fat disorder Diabetes Glaucoma Yes No Relationship Cancer (type): Alcohol/drug problems Psychiatric illness Suicide Yes No Relationship HEIGHT WEIGHT Have you ever had or have you now: (please check at right of each item and if yes, indicate year of first occurrence) High blood pressure Hay fever Jaundice or hepatitis Rheumatic fever Heart trouble Pain or pressure in chest Shortness of breath Asthma Pneumonia Chronic cough Head or neck radiation treatments Tumor or cancer (specify) Malaria Thyroid trouble Diabetes Serious skin disease Allergy injection therapy Arthritis Concussion Frequent or severe headache Dizziness or fainting spells Severe head injury Paralysis Disabling depression Excessive worry or anxiety Ulcer (duodenal or stomach) Intestinal trouble Pilonidal cyst Frequent vomiting Rectal disease Severe or recurrent abdominal pain Hernia Easy fatigability Anemia or Sickle Cell Anemia Eye trouble besides need glasses Bone, joint, or other deformity Knee problems Recurrent back pain Neck injury Back injury Broken bone (specify) Kidney infection Kidney stones Protein or blood in urine Hearing loss Sinusitis Severe menstrual cramps Irregular periods Sexually transmitted Blood transfusion Alcohol use Drug use Anorexia/Bulimia Smoke + pack cigarettes/week Regularly exercise Wear seat belt Mononucleosis Gall bladder trouble or gallstones Bladder infection Other (specify) Please list any drugs, medicines, birth control pills, vitamins, minerals, and any herbal/natural product (prescription and nonprescription) you use and how often you use them. * Provision of Social Security number is voluntary, is requested solely for administrative convenience and record-keeping accuracy, and is requested only to provide a personal identifier for the internal records of this institution. 5 GUIDELINES FOR COMPLETING IMMUNIZATION RECORD IMPORTANT The immunization requirements must be met; or according to NC law, you will be withdrawn from classes without credit. Acceptable Records of Your Immunizations May be Obtained from Any of the Following: (Be certain that your name date of birth, and ID Number appear on each sheet and that all forms are mailed together. The records must be in black ink and the dates of vaccine administration must include the month, day, and year. Keep a copy for your records.) High School Records These may contain some, but not all of your immunization information. Contact Student Services for help if needed. Your immunization records do not transfer automatically. You must request a copy. Personal Shot Records Must be verified by a doctor s stamp or signature or by a clinic or health department stamp. 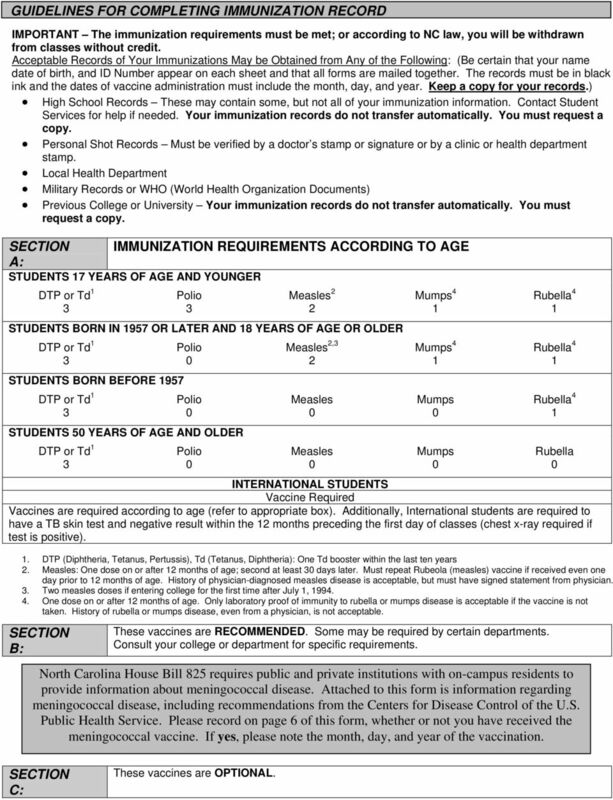 Local Health Department Military Records or WHO (World Health Organization Documents) Previous College or University Your immunization records do not transfer automatically. You must request a copy. SECTION IMMUNIZATION REQUIREMENTS ACCORDING TO AGE A: STUDENTS 7 YEARS OF AGE AND YOUNGER DTP or Td Measles 2 2 STUDENTS BORN IN 957 OR LATER AND 8 YEARS OF AGE OR OLDER DTP or Td STUDENTS BORN BEFORE 957 DTP or Td STUDENTS 5 YEARS OF AGE AND OLDER DTP or Td Measles 2, 2 Measles Measles Mumps 4 Mumps 4 Mumps Mumps Rubella 4 Rubella 4 Rubella 4 Rubella INTERNATIONAL STUDENTS Vaccine Required Vaccines are required according to age (refer to appropriate box). Additionally, International students are required to have a TB skin test and negative result within the 2 months preceding the first day of classes (chest x-ray required if test is positive).. DTP (Diphtheria, Tetanus, Pertussis), Td (Tetanus, Diphtheria): One Td booster within the last ten years 2. Measles: One dose on or after 2 months of age; second at least days later. Must repeat Rubeola (measles) vaccine if received even one day prior to 2 months of age. History of physician-diagnosed measles disease is acceptable, but must have signed statement from physician.. Two measles doses if entering college for the first time after July, One dose on or after 2 months of age. Only laboratory proof of immunity to rubella or mumps disease is acceptable if the vaccine is not taken. History of rubella or mumps disease, even from a physician, is not acceptable. SECTION B: These vaccines are RECOMMENDED. Some may be required by certain departments. Consult your college or department for specific requirements. North Carolina House Bill 825 requires public and private institutions with on-campus residents to provide information about meningococcal disease. Attached to this form is information regarding meningococcal disease, including recommendations from the Centers for Disease Control of the U.S. Public Health Service. 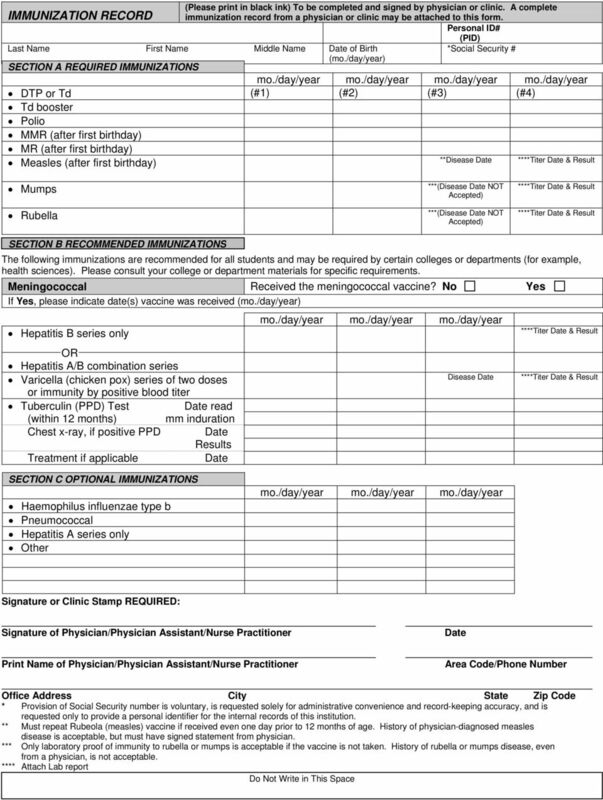 Please record on page 6 of this form, whether or not you have received the meningococcal vaccine. If yes, please note the month, day, and year of the vaccination. SECTION C: These vaccines are OPTIONAL. The Immunization Office, located in the Student Health Center, is open year round to administer needed immunizations at a nominal fee. Student Health Services 2815 Cates Avenue Raleigh, NC 27695-7304 919-515-2563 healthcenter.ncsu.edu The Immunization Record Form is designed to collect information about your current immunization status. Nurse Aide. Clinicals ** April 25 April 27, 2016 7:00 A.M. 3:00 P.M. or 6:00 A.M.-2:00 P.M.
Immunization Forms Welcome to Clemson University! We are glad you have chosen us to meet your higher education goals. The University requires a complete immunization record to be on file at for all students. Print Provider Packet and schedule an appointment with your healthcare provider to complete the packet. Application For Admission To The Non-Surgical Spinal Decompression Program At The Spinal Decompression Center of Long Beach If you are reading this form, you have qualified for a consultation with Dr.
AGREEMENT AND INFORMATION We would like to welcome you to our office. Please review this Agreement and Information sheet to assist you in understanding our office policies. Our therapists are private practitioners. New River Health will bill private insurance, Medicaid, and CHIP for eligible students. No child will be denied services due to inability to pay. The Richwood School-Based Health Center is pleased to offer medical, mental health counseling, health education, and on site dental services to all Richwood Middle School and Richwood High School students. Physical Examinations Effective with the 2001-2002 UWF Catalog, any student applying to enter the Athletic Training Education Program must complete a comprehensive physical examination by a licensed physician. Current (within 1 year) Tuberculin PPD or skin test administration. If PPD results are positive a chest x-ray is required (p. 7). Use the steps below to complete the CertifiedBackground (CB) electronic health record tracking process. 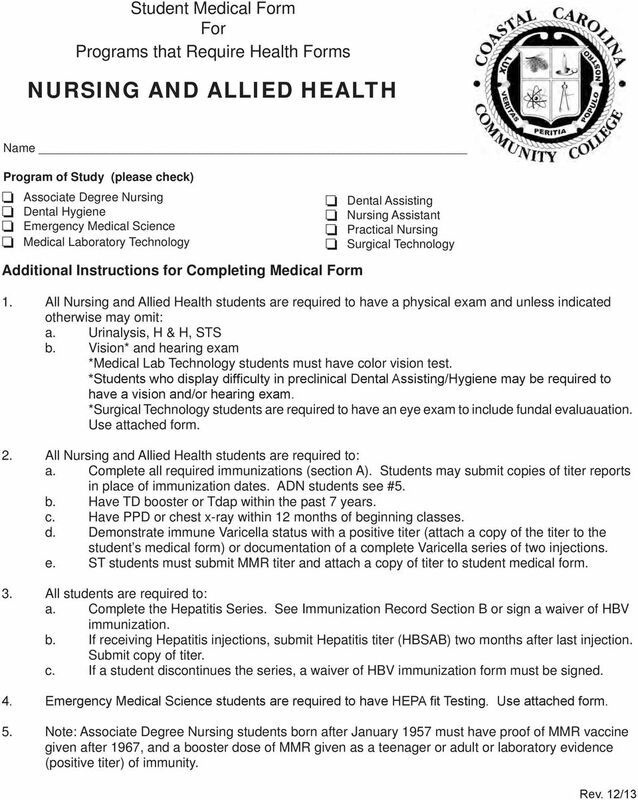 Medical Coding Health Requirements Checklist All MATC Health Science students are required to complete and upload health requirements prior to petitioning for courses which contain a clinical component. Horizon Eye Care, P.A. Patient Information Sheet. For your convenience, please print and complete the pre-registration forms before your visit. 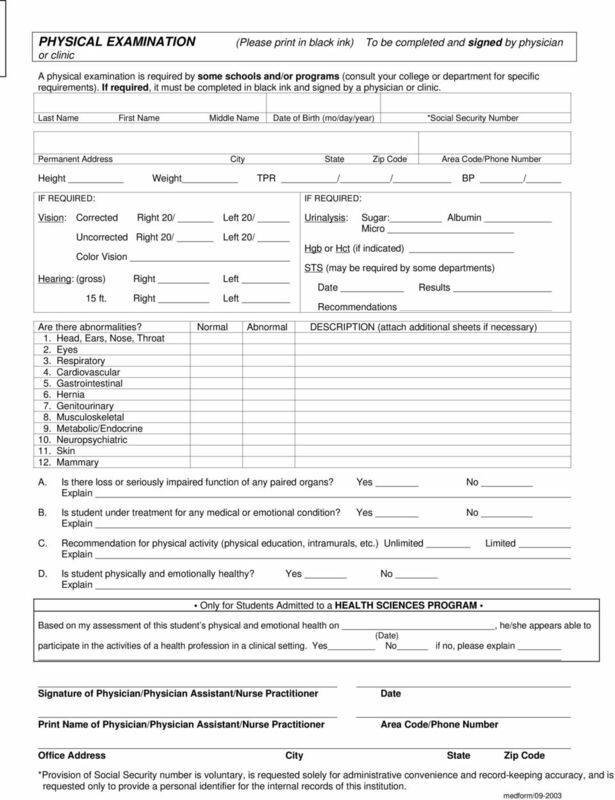 TRINITAS SCHOOL OF NURSING STUDENT HEALTH RECORD Please complete this form to the best of your ability and bring it to your Physician, Nurse Practitioner or Physician s Assistant for your physical examination. 6. Do you have an Advance Directive or Living Will? Yes No These are written statements about how you want to be treated if you get very sick. 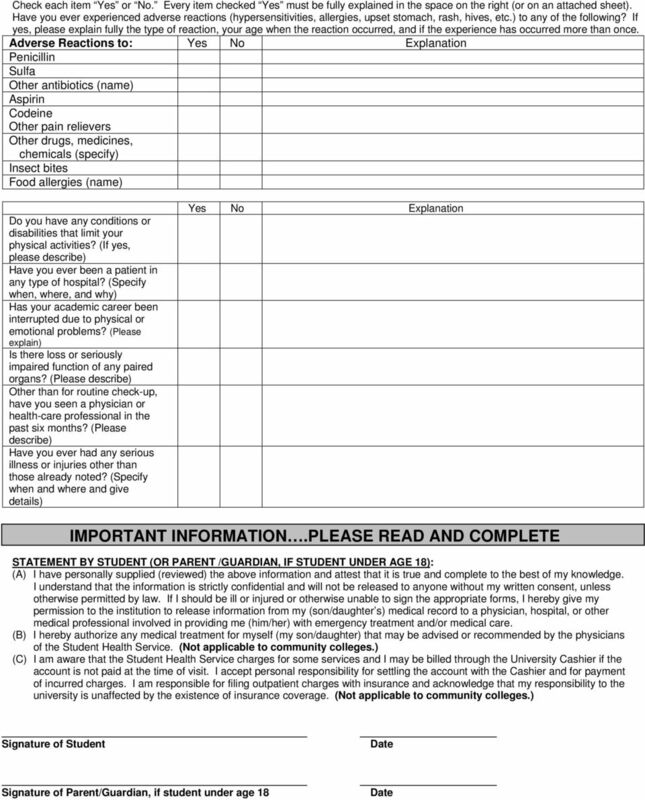 Failure to submit this completed form with correct documentation by the deadline may result in loss of your seat in the nursing major. Please fill out forms, sign where needed and bring with you to your first visit. If you have any questions please call the office at 212-751-8300.